RADO Hyperchromes: the importance of a crate monobloc.The RADO watches Hyperchromes show that sometimes what counts most is what's outside. The RADO watches Hyperchromes show that sometimes what counts most is what’s outside. The advantages of the high-tech ceramics are well documented: Rado, in particular, has introduced this material in watchmaking since 1986. The high-tech ceramics innovative, lightweight, hypoallergenic, offers optimum comfort adapting quickly to the temperature of the skin of the wearer. 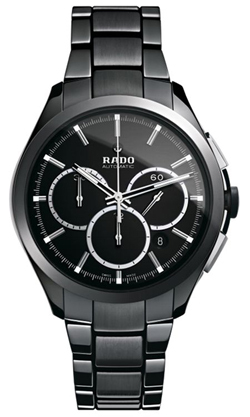 Establishing in 2011 a new standard for ceramic watches Rado has been the pioneer of revolutionary materials combined with innovative design. Previously banks ceramic watches had always contained a ‘heart’ of steel. For the extreme thinness of his chest line of Rado Thinline has made it impossible to use that material. The end result of the design is materialized with a resounding success: a box clock made entirely of ceramic can offer unrivaled levels of lightness and comfort. This realization than ever before, known as ‘cash-piece’, then opened the way for the creation of the new Rado Hyperchromes. The objectives of the project were to create a watch with a case extremely lightweight, very comfortable and available in a range of different colors. The ceramic case piece was the natural choice, but not simpler. The twenty-five years of experience with high-tech ceramics Rado watches have helped to develop the process of creating a one-piece case. The ceramic in liquid form is injected into a mold and subjected to pressures arriving up to 1000 bar. The pressure is then slowly released to allow the mold to slowly release the lock. Finally, the piece is ‘sintered’ in an oven at a temperature of 1450 ° C.
As has always been an expert in the use of advanced materials and innovative, Rado has met its biggest challenge in creating a mold that would include all the necessary ports for connection of the bracelet, the side panels, crown and buttons. They are inserted by hand in a second time. 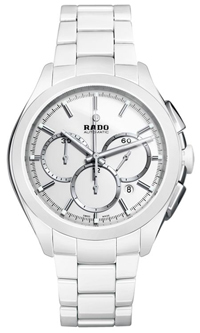 Rado Hyperchromes requires that its mold looks like a precision instrument. With materials of extreme hardness if anything is even slightly out of place, then it would be impossible to add movement and other details, so the material should be completely unusable waste. Another difficulty is that the high-tech ceramics during sintering is reduced by 23%. Thus, not only the mold must be particularly careful in design, but also its size must therefore consider the right shrink ratio to ensure that all cavities of the body are correctly sized to the tenth of a millimeter. At the end of all these works the chest piece of Rado Hyperchromes is materialized in a watch with a classic design, practical and durable.